Would you have lunch and dinner in the same restaurant? Well, I think you would if you were in Roseburg, and the restaurant was Brix 527. That's what I did a couple of months ago. Steven and I headed off to Roseburg early one morning in April so that I could attend a business conference (TOC-OWA; The Oregon Consortium / Oregon Workforce Alliance), arriving in town just in time for a quick lunch before joining the afternoon session. The restaurant was packed, and the crowd was alive. Sounds echoed off the brick wall that lines the room. We debated, "Did we want the small table with the high chairs or did we want to wait? The answer was a quick, "Yes, let's take it - we're running late." Located just 35 miles southwest of Portland, the city of McMinnville has a lot going for it. There's the Evergreen Aviation Museum, with the "Spruce Goose," another 200 or so aircraft and exhibits, IMAX theatre, and, of course, the newly opened Evergreen Wings & Waves Waterpark. There's also Linfield College with its 1,700 person student body pursuing a liberal arts curriculum in the private facility which was chartered in 1858. And then, there's the fact that McMinnville is located in the heart of Oegon's wine country, which is blessed with a long, moderate growing season that produces exceptional wine grapes. We weren't in McMinnville to sample any of these assets. We were there to sample the cuisine, and our first stop was the lovely and unique restaurant and bar, La Rambla, with its northwest-inspired cuisine from Spain. 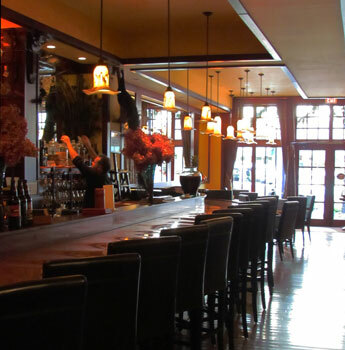 Located in the historic Schilling Building, LaRambla has as an impressive interior: a beautiful wood entrance, dark mahogany, a copper-topped bar, original artwork, and a multitude of gorgeous, hand-blown light fixtures. The hand-blown light fixtures are stunning. One of the many delights about living on the southern Oregon coast is that we’re half way between Seattle and San Francisco, a day-long drive to either. What good fortune; it’s an easy drive to the many cultural and culinary events that make visits to both of these beautiful, world class cities so rewarding! Given our proximity to the City by the Bay, it’s not unusual to find us in China Town, walking the streets, smelling the aromas, savoring the sights. Nor is it unusual to see us seated a few blocks away from there, in T2J Thai Restaurant, our all-time favorite Thai restaurant. We don't often go back to the same restaurants, at least not frequently; there are so many good ones in San Francisco, it's fun to try new places. We make an exception for T2J Thai Restaurant, and almost never visit the city without dining there. T2J Thai was formerly known as the Little Thai Restaurant. This is how I will always remember Siam Society: Seated in a courtyard surrounded by blooming vines of wisteria and a lively crowd of patrons with a starry canopy above and intriguing dishes filling the patio table. What a delightful memory! It was a warm evening in June, and we set out to treat ourselves to dinner at the Siam Society, located in a converted power substation in the trendy Alberta district . Recognized in numerous restaurant reviews including Bon Appetit, we quickly found that parking was at a minimum. We persevered and soon found a suitable spot several blocks from the restaurant. Walking past groups of Friday night revelers, we scaled the short flight of stairs to the restaurant and were warmly greeted by the enthusiastic, welcoming staff. 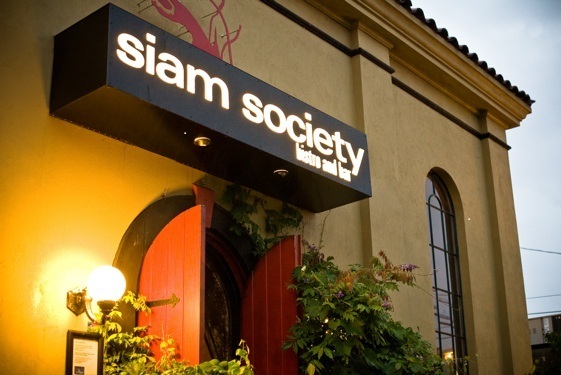 Siam Society: A charming Alberta District destination! We were surprised to see Jake's Mushroom Shack in Coos Bay open for business early in June. The door was open, and several men were visting beside an old pickup with its hood up. We would have expected Jake's to have been closed up tight by the early part of June. What could Jake be buying? Curious, we just couldn't resist stopping to say "hi" and ask "what's happening?" 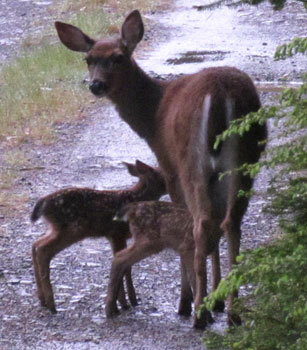 Late May brings newborns to our woods. June Mushrooming on Mt. Hood - morels, puffballs, brains, peziza, suillus! We were fully prepared to be disappointed. The weather had been cool and damp on Mt. Hood. So it was that we resisted getting our hopes up when we left our Brightwood cabin early on Saturday morning, June 4, with mushroom baskets in hand for our first spring mushroom foray. Would there be spring mushrooms or not? Would we find edible mushrooms on Mt. Hood? Amazingly, what we found was a wonderful array of our favorite spring mushrooms: blond morels (with stems up to 2 inches in length and caps measuring 4-5 inches in length) and a collection of giant puffballs (many of which were the size of baseballs) - and all at the peak of perfection! Large blond morels greeted us at one of our favorite Mt. Hood locations. We thought the other mushrooms might be helvellas, a particular favorite. 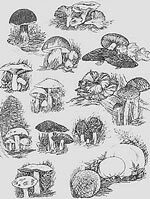 Instead, spore prints revealed them to be the poisonous brain mushrooms. Always use extreme CAUTION when collecting wild mushrooms! I've been saving Martha Stewart's Eggs and Morels Baked in Cream recipe, waiting for spring to provide us with a collection of treasured morels. When the morels came early in June, I made the recipe, and it's a real keeper: rich and very tasty. It was worth the wait!